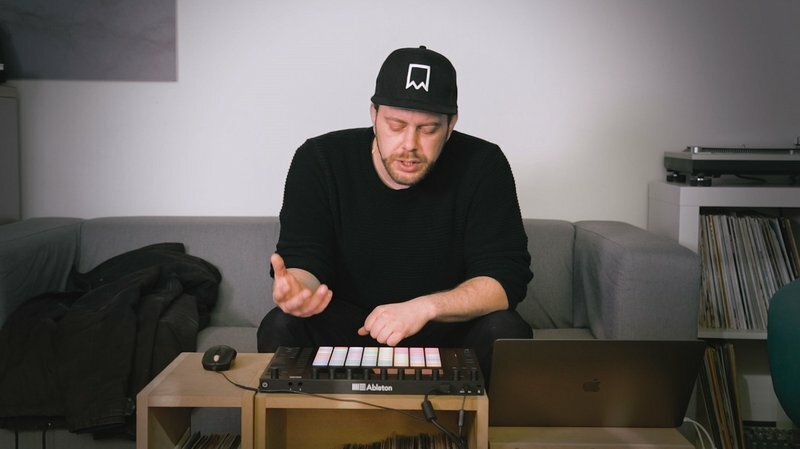 We recently invited hip hop beatmaker extraordinaire Clockwerk to share a one take Push performance using only a single Drum Rack. In that video, you can see that by preloading all song components into each pad across the Rack, Clockwerk is able to quickly tap out drum patterns, vocal stabs, and bass without switching layouts. He balances a steady rhythm with fluid synth hits and swinging snares by organizing everything he needs in a patterned and accessible layout. Clockwerk uses pad placement and a unique color scheme to arrange all song elements across Push. One of his featured useful tips is layering vocal samples underneath certain drum sounds to give instant atmosphere when building a beat. Clockwerk also utilizes a set of pads for the “moodswitch”, which acts as a hook and allows for a sonic change of pace. All samples are organized by group, so he can find each component quickly. The groups also allow for streamlined mixing and can be rearranged on Push to fit individual playing preferences. Working within a single Drum Kit for all song aspects is a great way to impose a set of limitations into your track building. Watch Clockwerk's performance again below and challenge yourself to make a one take track and take it further by adding layers and samples of your own. Keep up with Clockwerk on Facebook and YouTube.